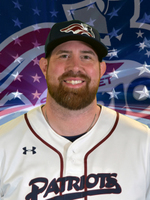 Hunton enters his eighth overall season with the Somerset Patriots and second as the team’s Pitching Coach/ Director of Baseball Operations. He previously spent six seasons as a record-setting relief pitcher; the latter four of which he was also the Director of Player Personnel. The North Plainfield, New Jersey native spearheaded a pitching staff that led the league in strikeouts (997) and finished second in ERA (3.62), WHIP (1.29), BAA (.253) and walks allowed (335) in his first season as pitching coach. He also played an integral role in putting together a roster that finished with the best overall record in the Liberty Division. Hunton finished his Atlantic League playing career as the single season (49, 2014) and all-time saves leader (167), 158 of which came with Somerset. Additionally, he was twice named an Atlantic League All-Star (2013 and 2016) and has won three Atlantic League championships, including two with the Patriots (2008 and 2015). In 2014, Hunton became the first player in professional baseball to hold the title of Director of Player Personnel while still playing. The 6’9” closer either led or finished second in the league in saves in four-straight seasons (2013-2016). He previously had years of service in both the Chicago Cubs and Oakland Athletics organizations. Hunton has 275 career saves over a 14-year career that’s taken him all over the United States and around the world.